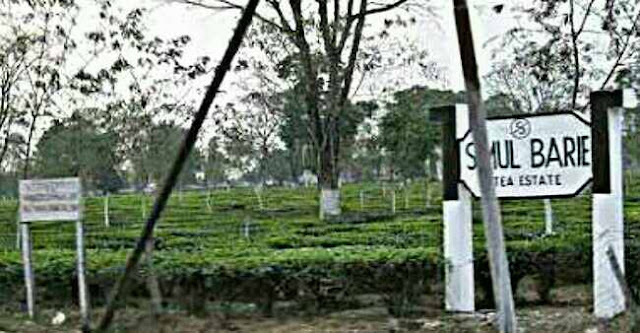 The management of a tea estate in the Terai has announced suspension of work in the garden, alleging that a section of workers, along with "land mafias", is preventing it from planting tea saplings on unused land. The notice announcing the suspension of work was issued in Simulbarie Tea Estate, 15km from here, on January 31 and workers came to know about it yesterday. The garden is near Sukna and on the way to Rohini Road that connects Siliguri with Kurseong. "We have 30 acre of fallow land in our garden. For the past few years, we have been trying to increase our cultivation area and plant saplings in the fallow land. However, time and again, we have been stopped by a section of workers, along with outsiders. All necessary permissions are available with us but whenever we were trying to plant tea bushes in the land, we faced obstruction," M.P. Bansal, the owner of the estate, said. He said prohibitory orders had been imposed on the land concerned by the district administration. "Even then, when police and our representatives went to the site on Monday to plant saplings, they were stopped. A section of workers used to carry out farming on the land which has been leased to us earlier. We have come to know that some land mafias are instigating workers and have promised them to help sell the land. In this way, the workers can earn good money. This is completely illegal and as our managerial employees are being constantly intimidated by these people, we are finding it tough to run the garden," Bansal said. In the notice served by the senior manager of the garden, it has been mentioned that "a group of workers and outsiders along with some land mafias are bent upon dislocating the discipline, peace, tranquility, and work schedule of the estate with their constant ill-conceived course of action to grab a fallow area of leasehold land... where the management proposes to undertake extension of tea cultivation". The estate has a total area of 1,325 acre, of which 720 acre have tea bushes. The garden makes around 5.75 lakh kg of tea a year and employs around 700 permanent workers and 400 casual labourers. "It is one of the prominent gardens in the Terai and has no other problems like workers' dues or low production. However, the management is beleaguered with a law and order issue as some workers and outsiders want to grab a portion of the leasehold land. We hope the district administration will take necessary steps," U.B. Das, the secretary of the Terai Indian Planters' Association, said. According to garden sources, some local leaders of the Gorkha Janmukti Morcha were creating the problem. "The management had spoken to leaders of the Morcha's trade union several times and they said there wouldn't be any problem if we took up the planting of saplings. The union leaders are now telling us that those who want to grab the land are not listening to them. Those who are stopping the work include some local Morcha leaders and supporters," said a garden source. The Morcha has a steady support base in the Simulbarie area. As the garden is located off the Rohini Road - the principal road to the Darjeeling hills from the plains these days - they are trying to encroach on some land of the garden and open up shops and other businesses. Leaders of the Darjeeling Terai Dooars Plantation Labour Union, the union of the Morcha, have, denied the allegations. "We don't support encroachment of land. But in the Simulbarie garden, some workers have been carrying out farming for several years and the management's sudden decision has disappointed them. None from our trade union is involved in any such incident," Harihar Acharya, the president of the Terai unit of the union, said. According to him, some local people have raised protests against the management's decision. "We want the management to resolve the issue through talks. Whatever is legal should be done in this case. But simultaneously, the management should reopen the garden. There is no point in causing inconvenience to the entire workforce," Acharya said.